In producing video for broadcast, the preproduction planning can make or break you. It the critical first step in a successful production. 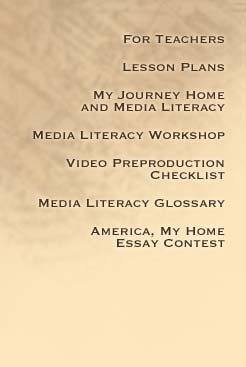 Now that you have gone through your Media Literacy workshop, here is a quick checklist of procedures and terms to assist you in producing a quality video. Use a concept. A plan helps you shoot less and use your time and resources more efficiently. The more time you spend developing your concept, the easier your production will be. Identify your audience, message and treatment. Whom do you want to reach? What do you want to say? How are you going to say it? And why. Storyboards. The storyboard is the visual map of the action you intend to shoot. Script. The script is the written portion of your production. It includes dialogue (what the actors say) and narration (the voice-over of the narrator). Study and be aware of all features of the camera you are using before you take it out on location. Be especially familiar with these items: tripod, auto-focus, record button, zoom, battery pack. It is best to shoot with the light behind you. Put your subject facing toward the light. Always charge your battery pack overnight and have an extra one for backup. You can use the camera on a tripod, cradle the camera for a low shot, or steady the camera on your shoulder. The key is to always stabilize your camera. Overshoot your scenes. Better to have too much that not enough footage. Using special effects is fine. They can add to your production, but be careful not to overuse them. They can be too gimmicky. Use zooms with caution! The further you zoom in, the shakier the shot gets. Take too long, not very dramatic. Physically moving the camera like humans see can be an interesting point-of-view shot. Be interesting; shoot film style. Don't just let stuff happen in front of the camera; use it to tell a story. Think about editing as you shoot. Always be thinking, don't go on autopilot. Types of shots. There are three basic shots to use in video production. The close-up (CU), the middle shot (MS) and the long shot (LS). Keep in mind that these shots can include one person, two people or a whole group. Variety of angles. A cover shot captures all the action (safety net). Over the shoulder shots are good for conversations. Cutaway shots show what's being talked about. Don't be afraid to get in there. Point of View. Can be first person (I/me), second person (you), or third person (they). Go where it's quiet. Try to have your mike as close to the source as possible  more signal less noise. Have people speak louder and project their voices. If you can't get close, you may have to dub in voice/sound later (tricky to do convincingly). Music. Sets the mood. Sets the pace. Sets the tone. Sound Effects. Add impact. Add realism. Edit video to your audio. Lay down voice-over track first. Then sound bites. Then "fill holes" with B-roll (extra footage that you have already shot). No video or images from copyrighted sources! This includes just about anything you can think of! Get Release Forms From Everyone On Camera! You Have 60 Seconds. That's It! Keep message simple and focused. It's just TV, not brain surgery! Learn. There's no right or wrong way to do your essay. Look at how others do it; learn from their work. Be creative! Ask, "How else could we do it?"